A 15-minute trailer bundled with the limited edition of 14th Baki-Dou manga volume. 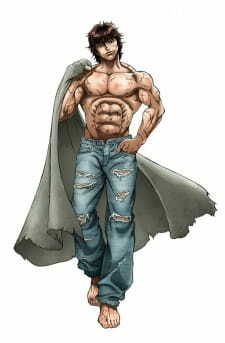 Despite being bundled with Baki-Dou, it will adapt part of the "Most Evil Death Row Convicts" arc from Baki: New Grappler Baki. The arc features underground ring fighters in the no-rules combat environment of death row convicts. This OVA is no more than a preview as listed in the synopsis. But it took just an OVA to get me interested in the manga until an anime is released (supposedly 2018?). After reading the manga the OVA really highlights the fight scenes in the manga. The story is about 17 (or 15 I don't remember) year old Baki and his fight to become the strongest fighter and beat his dad in a fight. When fighting there are no rules; anything and everything is fair game. The artwork from this preview seems similar to Drifters (aired Fall 2016). But that is about as much as you can get from this short clip. Overall, this is a short video that highlights the major fights of the manga. There is not much enjoyment to get from it, but it did get me interested in the manga itself. Because of this OVA, I am looking forward to when an actual anime gets released. Is anyone gonna pick this up?